For years, Lesser Prairie Chickens have been on the front-line of a world changing for the worse. Their native habitat in the grasslands of Texas, Oklahoma, Colorado, New Mexico and Kansas has been imperiled by drought associated with climate change as well as human encroachment -- causing their population to drop by half just this year alone. Environmental groups have filed suits urging the U.S. Fish and Wildlife Service to list the declining birds as an endangered species, but the proposal is being met with some powerful, corporate opposition. Lesser prairie chicken habitat, it turns out, is centered upon land that Chevron would like to drill on -- and such Federal protection would prevent them from accessing it. In response, the energy company secretly paid $25,000 to sponsor a panel with the American Legislative Exchange Council, a group made up of conservative lawmakers that craft corporate-friendly policy, to keep threatened wildlife from hampering their business. An ALEC planning document, obtained by the Center for Media and Democracy, indicates the panel will discuss how Endangered Species listings "often negatively impacts and stifles energy development of all kinds." Chevron was mentioned as a donor. According to the Huffington Post, Chevron and other energy companies are pushing for state-level conservation plans as an alternative to listing lesser prairie chickens as "endangered" -- which would allow drilling within their habitat. 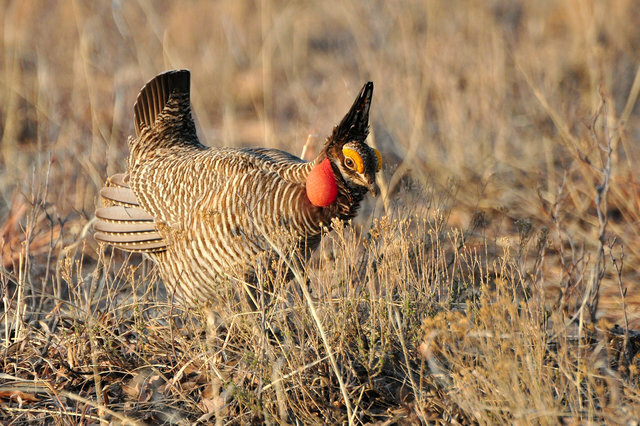 "[Their plan] essentially locks the lesser prairie chicken into small, postage-stamp size areas of habitat that are too small to support reproductive populations, and it will effectively preclude their recovery," he says. "The Obama administration routinely bends to industry pressure. Whenever it has the chance to do the right thing, it bends over and gives industry its way, especially on endangered species issues." A final decision on whether lesser prairie chickens will be granted Federal protection is expected in March 2014.